I’ve been fascinated with him for years. He’s wild and lives alone, and everyone has been smart enough to keep their distance. I see something in him that I see in myself, and I want to explore that. He’s untamed and raw, and maybe dangerous. She shouldn’t have come to me, but now that she’s here, I can’t let her go. I don’t do well around others, so going off the grid has been for the best. What Lexi doesn’t know is that I’ve noticed her for years and wanted her as mine for just as long. It would be safer if I kept her at a distance, which I’ve managed to do … but I can’t anymore. I hope she’s ready to be mine, because she’s about to see exactly how feral I can be where it concerns her. 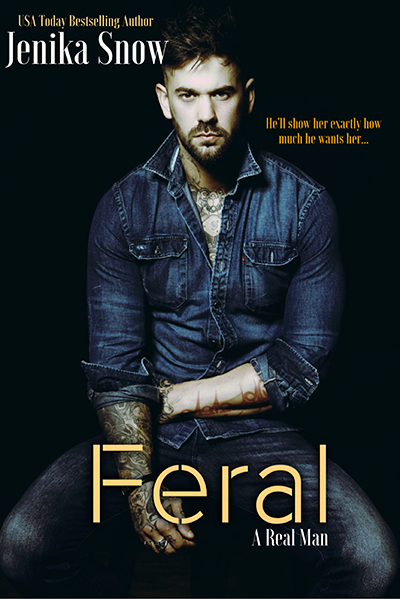 Warning: This book is wild and dirty, short and smutty. Sure, it’s unbelievable, and features a celibate recluse who will make the woman he wants his at all costs, but who doesn’t like it that way? If you are into an over the top alpha hero, and some filthy goodness, dive in.